The dearth of homes for sale in Loudoun continued last month, but there are signs the market may be picking up this spring. February saw the fewest number of active listings on a year-over-year basis in more than a decade. 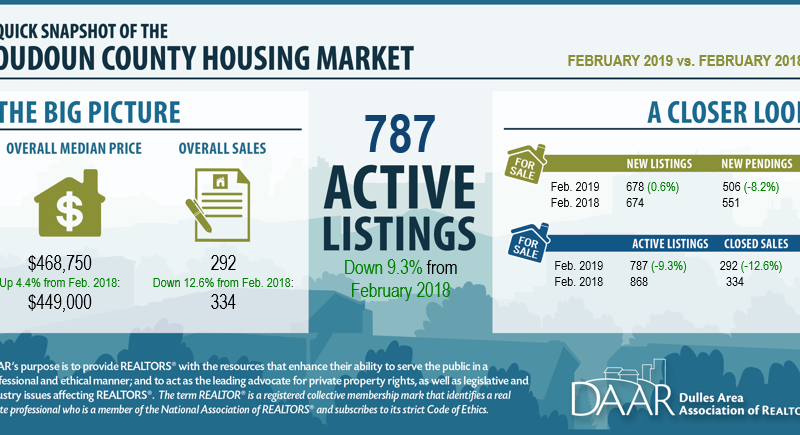 The number of active listings in February has declined for the past four years, from a high of 1,622 in 2015 to 787 in 2019. Only 292 home sales closed in February. The tight market has been good for sellers, who have seen an increase in sales prices and a continued narrowing of the sales-price-to-list-price ratio. The median sales price increased 4.4 percent, from $449,000 in February 2018 to $468,750 last month. It was the fourth consecutive February increase, resulting in the highest February median sales price in more than a decade. The average sales-price-to-original-list-price ratio continued a longer-term trend, increasing 0.5 percentage points from 98.1 in February 2018 to 98.6 in February 2019, according to data compiled by the Dulles Area Association of Realtors and the Center for Regional Analysis at George Mason University. Homes also are selling more quickly. The median days on the market last month was 34, down from 53 days in 2018 and 104 days in 2016. While tight inventories have dominated market headlines for more than a year, analysts have seen evidence of changing trends. First, active listings increased in three of Loudoun’s eight ZIP codes compared to last February. Ashburn’s 20147 ZIP code saw the largest increase, at 36.8 percent, followed by 20175 in Leesburg (14.1 percent) and Ashburn’s 20148 (1.8 percent). Inventories continued well below 2018 levels in Sterling, Aldie and Chantilly. The increase in new listings was driven primarily by townhomes. The number of new listings of townhomes increased 22.4 percent from February 2018. The number of new listings of condos increased 4.2 percent over the same period. In contrast, new listings of detached homes declined 13.3 percent. Another possible sign the tight market may begin to ease, according to the report, is the modest increase in the number of new listings. Although February 2019 outpaced the previous year by only four units, any increase is notable following months of declines. Despite signs of near-term easing, the number of closed sales continued to decline. The number of closed sales decreased 12.6 percent from February 2018 to February 2019. Home sales in Ashburn’s 20148 ZIP code led in median sales price, at $603,000. That was nearly 20 percent higher than the second highest priced market, Aldie’s 20105 ZIP code at $507,000. The lowest median sales price was in Sterling’s 20164 ZIP code, where February’s $405,000 sales price was a 10 percent increase over 2018. Only Sterling’s 20165 ZIP code saw a decline in median sales prices compared with February 2018—$435,000 from $450,000.